Please find details of the exhibition below. We'll have chance to talk to him as well. 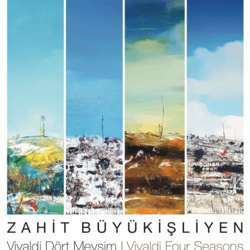 As an organization of Mine Art Gallery, “Vivaldi Four Seasons” exhibition of Zahit Büyükişliyen, a professor at Yeditepe University, Faculty of Fine Arts, will be held at Protected content as of February 5, Protected content . The exhibition includes the artworks created as an impression of “Four Seasons” concertos of the great composer Vivaldi. The opening cocktail of the exhibition will be held on Tuesday, February 5, Protected content , at Protected content with the participation of the artist. The exhibition can be seen until 15 March Protected content . All art lovers are invited.